Aperture Science's complex tube network as seen in Portal 2. Tubes are a vital part of the Aperture Science Enrichment Center. The tube network is a nexus used for product delivery throughout the facility. Often, the tubes will be used to deliver various products by the company that need to be put through testing against the Handheld Portal Device, such as the cubes and the turrets. 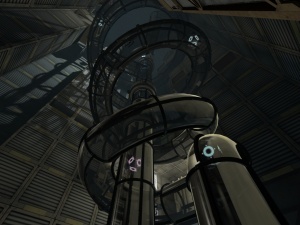 In Portal 2's cooperative campaign, the tubes are widely used for transporting the components of Atlas and P-body during, after, and before their assemblies throughout the facility. During Portal, Chell encounters a number of Vital Apparatus Vents, which are used to safely drop a testing element into the testing chamber. Whenever a vital testing item is lost, the Vital Apparatus Vent will replenish another replacement. When Chell escaped her testing track, it is discovered that there are a series of tubes leading all over the Enrichment Center, transporting the cubes. When Chell rides a burst tube, she is carried around by a pneumatic pressure inside the tubes and is brought back into Test Chamber 09 by GLaDOS. Portal 2 however introduces a new type of tube component, the Pneumatic Diversity Vents. The component supplies the vacuum needed around the tube networks, serving as checkpoints that will continuously provide endless pneumatic pressure into the tubes. In the single-player campaign's The Escape chapter, Chell discovers that the Pneumatic Diversity Vents also provide passive monitoring for Aperture products passing through the components; which was revealed that objects will be "identified but never judged". This also reveals that the Diversity Vents can be used to "divide" or "filter" objects away from other types of objects, such as the tubes that only seem to be carrying bombs in the single-player finale chapter, The Part Where He Kills You. In the cooperative campaign of Portal 2, Atlas and P-body are constantly built inside a tube by a Reassembly Machine checkpoint, which a malfunctioning version was witnessed in the Art Therapy testing course. Once they are fully built and activated again, the floors of the Reassembly Machine will open and deploy the robot duo into their testing chamber through their Vital Apparatus Vents. Throughout the co-op campaign, the tube network for Atlas and P-body are filtered away from other testing elements, preventing the bots from being rebuilt in front of an incoming object falling into the test chamber. The Pneumatic Diversity Vent was also put to use again in the Hub, as a way of transporting the bots into a mini-hub for additional testing courses. A vital part of the testing process, the tube networks deliver the weighted storage cubes, turrets, Atlas and P-body's components, and edgeless safety cubes through a series of Pneumatic Diversity Vents for carrying the aforementioned items throughout and into their respective Vital Apparatus Vents - strategically placed in a test chamber. Each test chamber is equipped with at least one tube, often serving as the "elevator shaft" in the Portal 2 chamberlocks for both the single-player campaign and delivering the components of Atlas and P-body in the co-op campaign. Test chambers with the possibility of losing a testing element such as the cube, will often have a readily available Vital Apparatus Vent tube component on a ceiling; used to replenish said testing element. Portal 2's developer commentary reveals that the tubes were designed in a typical Aperture Science thought; a ridiculously complex, inefficient, and expensive solution to a simple transportation problem.